I love Giggling Snowman from Mo’s Digital Pencil. I have lost track of how many times I’ve colored this image, let’s just say it’s a whole lot. On today’s card, I’ve colored him using blues, once again. I love blue for Christmas, I can’t help it. 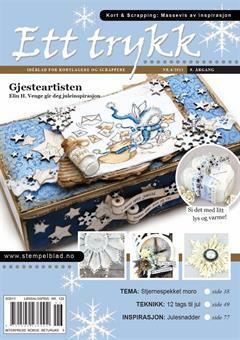 I fussy cut my little snowman and stamped a Norsk Stempelblad AS sentiment on a diecut banner. I’ve dry embossed the bacground using a cover plate die from Neat and Tangled. I’ve added a few Papirdesign dots, mounted my dry embossed panel on foam tape and added a diagonally striped patterned paper from Papirdesign behind it. That’s it. Very clean and simple, and this time even fairly quick to make. My cards tend to be clean and time consuming, but this was clean and simple, it took me less than two hours from start to finish, including coloring.